iPhone Volume Buttons Not Working? Here's The Real Fix! You are at:Home»iPhone»Sounds»iPhone Volume Buttons Not Working? Here’s The Real Fix! The volume buttons on your iPhone won’t work and you don’t know why. Sounds are playing too soft or too loud and it’s starting to get frustrating. In this article, I’ll explain what to do when your iPhone volume buttons are not working! Are The Buttons Stuck, Or Can You Press Them Down? Are the buttons stuck down so you can’t press them at all? Can you press the buttons down, but nothing happens on the screen? Each problem has a unique set of troubleshooting steps, so I’ll break this article down by addressing scenario one first, and scenario two second. Even though your physical iPhone volume buttons aren’t working, you can always adjust the ringer volume in the Settings app. Go to Settings -> Sounds & Haptics. To adjust the ringer volume, use a finger to drag the slider. The further left you drag the slider, the quieter your iPhone will ring. The further right you drag the slider, the louder it will ring. When you drag the slider, a pop-up will appear on the center of the display to let you know the ringer volume has been adjusted. Apps that play songs, podcasts, or videos will also have a slider you can use to adjust the volume. For example, let’s take a look at the Music app. Near the bottom of the screen, you’ll see a horizontal slider you can use to adjust the volume of the song you’re listening to! The Podcasts app and your favorite video streaming apps will have a similar layout too. My iPhone Volume Buttons Are Stuck Down! Unfortunately, if the volume buttons are completely stuck, there’s not much you can do. A lot of the time, cheap rubber cases can jam the buttons on your iPhone. Try taking the case off of your iPhone and pressing the volume buttons again. If they’re still jammed, you’ll probably have to get your iPhone repaired. Scroll down to the bottom of this article to explore your volume button repair options! If the volume buttons are stuck and you can’t get your iPhone repaired anytime soon, you can use AssistiveTouch! AssistiveTouch puts a virtual button on your iPhone’s display which has a lot of the same functionality as the physical buttons. 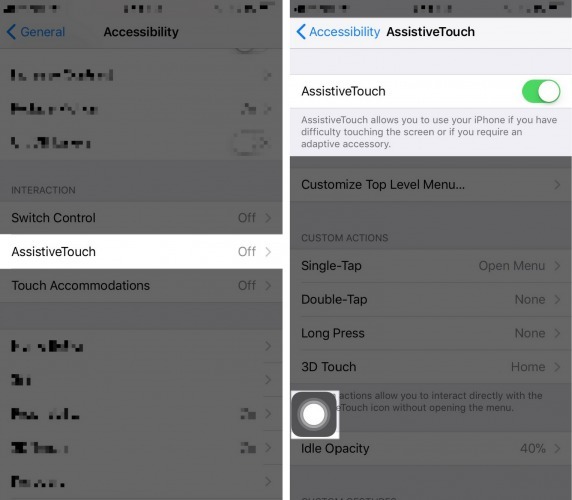 To turn on AssistiveTouch, go to Settings -> General -> Accessibility -> AssistiveTouch. Turn on the switch next to AssistiveTouch — the virtual button will appear. To use AssistiveTouch as a volume button, tap the virtual button and tap Device. You’ll see an option to adjust the volume up or down, just like you can do with functional volume buttons! I Can Press Down The Volume Buttons, But Nothing Happens! If you can still press down the volume buttons, you may be in luck! Even though nothing happens when you press down the volume buttons, this could be the result of a software problem. Follow the troubleshooting steps below to diagnose and fix the real reason why your iPhone volume buttons are not working! It’s possible that the software has crashed, freezing your iPhone. So, when you press the volume buttons on your iPhone, nothing happens. By doing a hard reset, your iPhone will be forced to turn off and back on. The hard reset will unfreeze your iPhone and hopefully fix the volume button problem. iPhone 6s and earlier: Press and hold the power button and Home button simultaneously until the Apple logo appears. iPhone 7 & iPhone 7 Plus: Simultaneously press and hold the power button and the volume button until the Apple logo appears. iPhone 8, 8 Plus, and X: Press and release the volume up button, press and release volume up button, then press and hold the side button until the Apple logo appears. 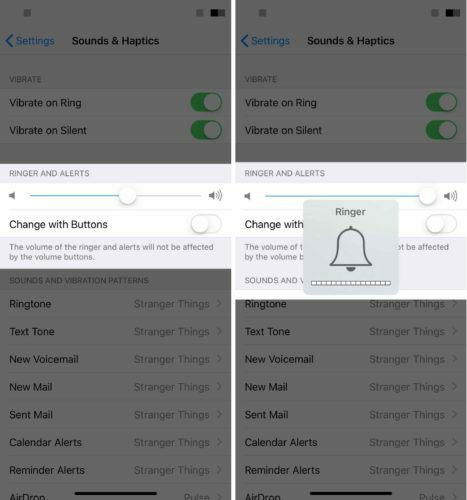 If you’re trying to increase or decrease the ringer volume on your iPhone using the volume buttons, make sure Change with Buttons is turned on. If this setting is off, the volume buttons will only adjust the volume for things like music, podcasts, and videos when played through headphones or your iPhone’s speakers. Go to Settings -> Sounds & Haptics and turn on the switch next to Change with Buttons. You’ll know it’s on when the switch is green! A DFU (device firmware update) restore is the deepest type of restore you can perform on an iPhone. The “F” in DFU restore stands for firmware, the programming on your iPhone that controls its hardware. If the volume buttons aren’t working, putting your iPhone in DFU mode could fix the problem! If the volume buttons still won’t work after you’ve performed a DFU restore, you’ll probably have to get your iPhone repaired. On early iPhone, broken volume buttons weren’t too big of a deal because all they did was adjust the volume. Now, volume buttons are much more important because they’re used to take screenshots on iPhone X and hard reset the iPhone 7, 8, and X. Set up an appointment at the Apple Store near you and see what they can do for you. We also recommend Puls, an iPhone repair company that sends a certified technician directly to your home or office. They’ll fix the broken volume buttons on-the-spot and cover the repair with a lifetime warranty. Your volume buttons are working again! Next time your iPhone volume buttons are not working, you’ll know where to come to fix the problem. Leave me a comment down below and let me know which fix solved your iPhone’s problem! Previous ArticleiPad Speaker Not Working? Here’s The Real Fix! Next Article iPad Volume Buttons Stuck Or Not Working? Here’s The Real Fix!